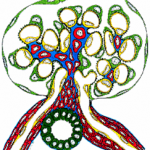 Drawing of a glomerulus, by Dr. Charles Jennette. The Glomerular Disease Collaborative Network (GDCN) was established in 1985 as a means of enhancing communication and research efforts between community nephrology offices and the University of North Carolina at Chapel Hill School of Medicine. The purpose of the GDCN is to learn more about causes and pathogenesis of glomerular diseases, as well as to find the most effective treatments for patients with these diseases. There are over 300 participating clinics and academic sites in the southeastern United States and beyond. The co-founders and co-directors of the GDCN are Ronald J. Falk, MD, Nan and Hugh Cullman Eminent Professor of Medicine, and Charles Jennette, MD, Brinkhous Distinguished Professor and Chair, Department of Pathology & Laboratory Medicine, and Professor of Medicine, Department of Medicine, both of the University of North Carolina at Chapel Hill. The foundation of the GDCN is the ongoing enrollment and follow-up of patients in sixteen specific glomerular disease registries. The goal of the patient registries is to identify patients at the onset of their disease and to follow the course of their disease throughout their life. Continual updates of patient’s medical records and contact information for the registries allow the GDCN to recruit patients for participation in a variety of more focused studies that may include collection of blood or urine, completion of questionnaires or telephone interviews and participation in treatment studies. In the case of treatment studies, patients are not contacted directly but if they are potentially eligible, their physician is contacted with the specifics of the study. The GDCN is continually enrolling patients in all registries, but currently the studies that are most actively recruiting include diagnoses of focal segmental glomerulosclerosis, membranous glomerulopathy, lupus nephritis and ANCA-associated vasculitis. Patients are usually identified for the GDCN registries by having their renal biopsy tissue evaluated at the UNC Nephropathology Laboratory, a diagnostic laboratory that provides this specialty service to many private practice nephrology offices throughout the United States. Patients are sent information about the registries through their own nephrologists, and informed patient or parental consent is required for their enrollment into the registry for long term follow-up of their medical records. Additional consent is needed for studies that require collection of samples, completion of questionnaires or interviews or for treatment trials. Patients who are not identified as described above can still participate in the registries, and are identified either by their own nephrologists or through collaborative research efforts with other nephropathology laboratories. Recruitment through these mechanisms is most often done to increase recruitment of patients for specific studies or among age groups or diseases where inclusion of as many patients as possible is needed to attain the numbers needed to answer specific research questions. For general inquiries, please contact Susan Hogan or Caroline Poulton at 919-966-2561. For more information on sending kidney biopsies to the UNC Nephropathology Laboratory, please call the lab 919-966-2421. Please see our staff listing for more contacts.